How To Understand Colorado DUI – DWAI – DUID DMV Actions After January 2014 – A Primer – This article is to summarize the state of the law in Colorado for DUI – DWAI- and DUID – Cases as a snapshot after changes made in 2014. I. Misdemeanor Drinking (Drugs) and Driving Crimes: Misdemeanor crimes involve the vast majority of driving after drinking charges or using drugs and driving. II. Felonies Drinking (Drugs) and Driving Crimes: If you are charged with an alcohol or drug related driving crime that is a felony – there was probably an accident that resulted in serious bodily injury or death. III. Class A Traffic Infractions: are still crimes but usually involve Underage Drinking Driver Offenses (UDD): Persons charged under this law involve persons under the age of 21 who have Blood Alcohol Levels than the minimum state levels and actually amount to a “Zero Tolerance� law. IV. Class 2 Traffic Misdemeanors: If the Underage Drinker and Driver is charged a second time with UDD (Underage Drinking Driver Offense) The under 21 driver is now charged with a second or subsequent charge of driving with a BAC level between .02 and .05. 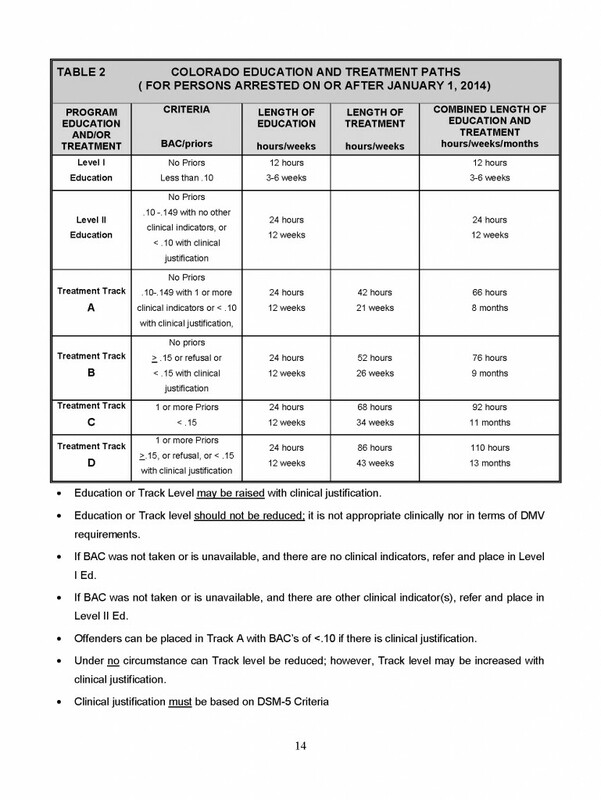 What Are The Levels Of Intoxication And The Evidence Based Standards For DUI – DWAI In Colorado After January 1, 2014? The Permissible Inference (Presumption of Intoxication and the “Per Se” Categories). A jury is instructed that under certain conditions – a Permissible Inference (Presumptive Inference) in a Colorado DUI is allowed where certain BAC’s – Blood Alcohol Contents are present. The inference is that a clear lack of mental judgment or physical control that makes safe operation of a motor vehicle impossible at certain BACs (Blood Alcohol Content). The inference is permitted at .08 or greater. For Marijuana driving (Effective May 28, 2013), the level is 5 ng of THC/ml whole blood. DWAI inferences – The (Presumptive inference) for DWAI means that there is the observation that judgment and physical control are affected to the slightest degree so that there is a lack of care in the safe operation of a motor vehicle. 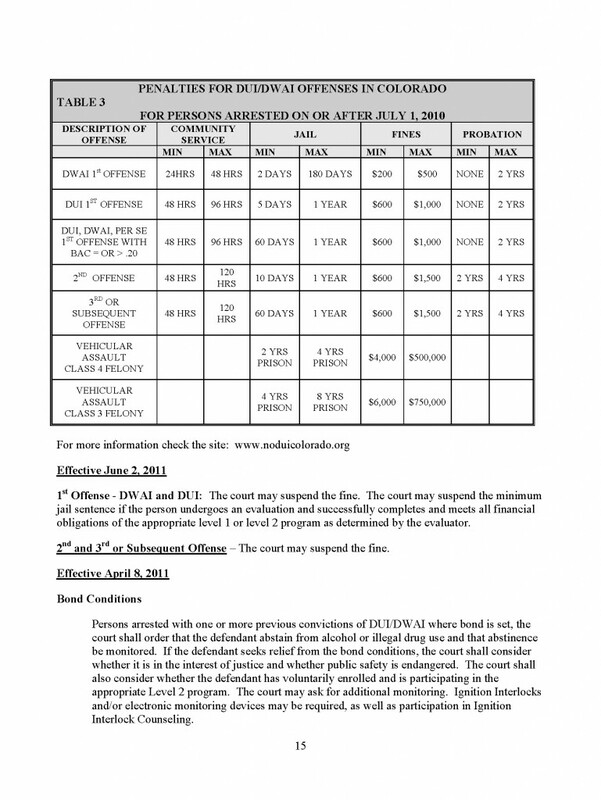 Here the inference is permitted when the BAC is between .051 and .079. – a level much lower than is required for a DUI. Drugged Driving is defined as the “measurable presence of a drug, legal or illegal, and the observation that mental judgment or where physical control is at the point where safe driving is impossible, or there is at least lack of care in driving. ” In the case of marijuana, if there is a drug test, the measurable presence of the active ingredient in marijuana – (again – THC – is a minimum of 5 nanograms/milliliter of whole blood). I. The accused is convicted. II. The DA agrees to a deferred judgment and sentence. III. The accused pleads Nolo Contendere (no contest – rarely allowed). IV. The accused is found not guilty. The criminal courts operate under Colorado’s penal law – the DMV functions using Colorado’s civil restraint laws for alcohol and other drug driving offenses and laws authorized under Colorado’s Administrative License Revocation Law (ALR). There is massive confusion amount by Colorado persons who are subject to these two sets of punishments for the same offense. Fines, restitution and community service. Probation with monitoring or various levels of intensity of supervision. Evaluation for alcohol or drug treatment. Alcohol and or Drug Education, treatment or various combinations of them including residential as well as outpatient care. When a convicted Colorado driver is evaluated for their treatment “needs” as regards problems related to alcohol or other drug use – the Court has the power to order not only alcohol or drug education – it can and often does order BOTH education and treatment programs. No Treatment – referral to in-depth psychological assessment. There is no “double jeopardy” when the Colorado DMV imposes sanctions that require additional punishments before you are permitted to drive in Colorado. The Colorado DMV Imposes Civil Sanctions That – Many Times – Have A Harsher Impact Than The Corresponding Criminal DUI Case. To say that the Colorado DMV is complex is a misnomer – it is an ” IRS like” labyrinth of laws and regulations that change every year. If you drive in Colorado you have already agreed to submit to the Colorado law that permits a police office to require a blood or breath test if s/he has probable cause to believe that you are impaired. The penalty for that refusal depends on when it happened (before or after January 1, 2014), whether it is your first you have refusals from past cases, and your age. Refusal suspensions result in a license revocation for at least one year. If it is your second refusal – it is two years and three years for your third refusal. The good and the bad news is – (bad) After January 1, 2014 you will be considered a Persistent Drunk Driver (PDD) (see below) The good news – you may apply for an Interlock restricted license after only 2 months of “total restraint” meaning no driving during that period of time. See my article on the January 2014 changes. Before January 1, 2014 – For a first offense with a BAC of .08-.169 resulted in a license the revocation of nine months with the availability of a interlock restricted license after one month of no driving. After January 1, 2014 – For a first offense with a BAC of .08-.149 results in the revocation of nine months with the availability of early reinstatement with an interlock restricted license after one month of no driving. Before January 1, 2014 – For a second or subsequent offenses required one year revocation with no driving, – early interlock reinstatement was available after one year of no driving. After January 1, 2014 – There is now two year revocation, but after 30 days of no driving – interlock restricted license may be obtained. 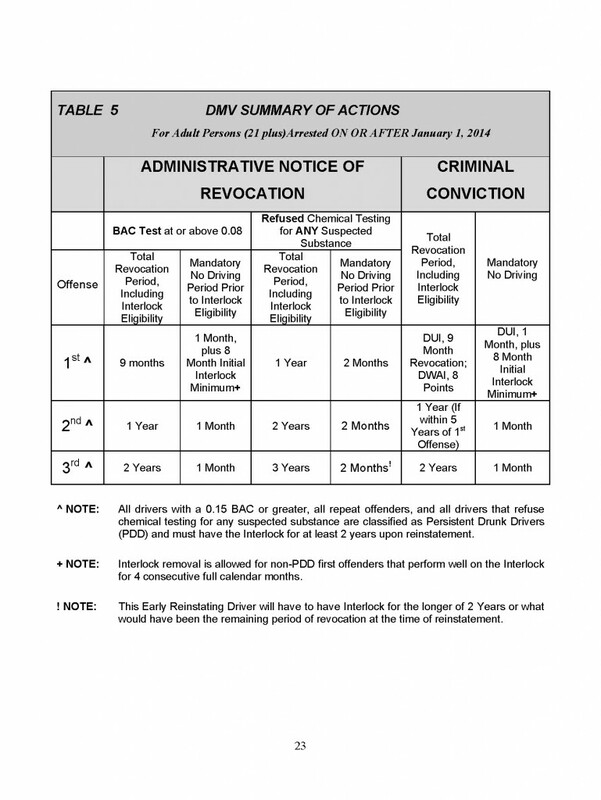 Before January 1, 2014 – offenders with a B.A.C. of 0.17 or greater as well as ALL repeat offenders, – required an ignition interlock restricted license for two years upon reinstatement. After January 1, 2014 – threshold is now BAC of .15 or greater but may apply for an interlock restricted license after one month. 1. Request a hearing – even if you refused to provide a blood or breath sample. 2. Us the DMV’s “official form” and either fax it or – better yet – hand deliver it to the DMV well before the seven days provided by the law. (I always recommend requesting – on the form – that the police officer who issued the express consent form – be present – it is optional and lawyers disagree). 3. Make certain to obtain the temporary driving permit which will allow you to drive until the date of the hearing. 4. Attend the hearing and retain a lawyer. 5. At the hearing the Colorado DMV Hearings officer decides if the express consent revocation is supported by the evidence and should be ordered – or whether it should be dismissed. 7. The revocation period of time is not up to the hearings officer – they are set by law – non-discretionary – and may not be altered by the hearing officer. NOTE: It may not seem possible – but you can WIN the criminal court case and still lose your driver’s license under the Express Consent Law. How You Will Reinstate Your Driver’s License After An Express Consent Law Revocation? 1. Pay a reinstatement fee. 2. File an SR-22 insurance form to show proof that the driver has insurance. For those with a B.A.C. of 0.15 or greater, Level II education and therapy is required as does a refusal to take “the test.” – 2-yr. mandatory ignition interlock restriction is required upon reinstatement. Education and therapy must start right after the most recent alcohol violation – even if there is more than one conviction. 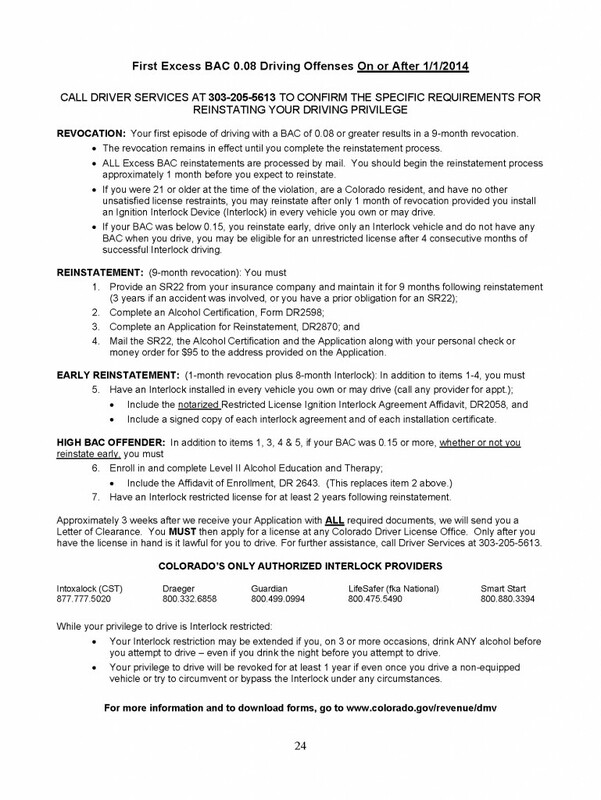 A Colorado Driver’s License may be reinstated if the revocation period is over, EVEN IF the Level II Education and Treatment have not been completed but the Level II Education and Treatment must continue uninterrupted to maintain the restored drivers license. If there is an interruption in the alcohol education and/or the treatment you will most likely lose your driver’s license. Also to kill a dangerous myth – know this – ANY DUI/DWAI conviction in Colorado does not “disappear” after 7 years or any other period in the common folklore – no – it remains on your driving offense record for your entire life. What Is A Colorado Persistent Drunk Driver (PDD) And Why Is It Important To Understand The Consequences Of The Categorization? If you fall into PDD category – you are required to successfully completion of Level II Education and Treatment. After January 1, 2014 those who refuses a test that is lawfully required, or who drive while under restraint for one or more alcohol-related driving offenses now fall into this category. What Exactly IS An Ignition Interlock? An Ignition Interlock is an electronic device that is installed on a motor vehicle that will not allow the vehicle to be driven by someone who has been drinking. The device is connected to the ignition and other systems.. and requires an alcohol-free breath sample before the vehicle can be started, and at ditto at random times while the vehicle is being driven. When Is the Ignition Interlock Device Mandatory? Persons who are revoked with a B.A.C. of 0.15 or greater, who are revoked for two or more alcohol related convictions, or who are Habitual Offenders with at least one alcohol offense are ALL required to hold a restricted license requiring an Ignition Interlock after reinstatement. 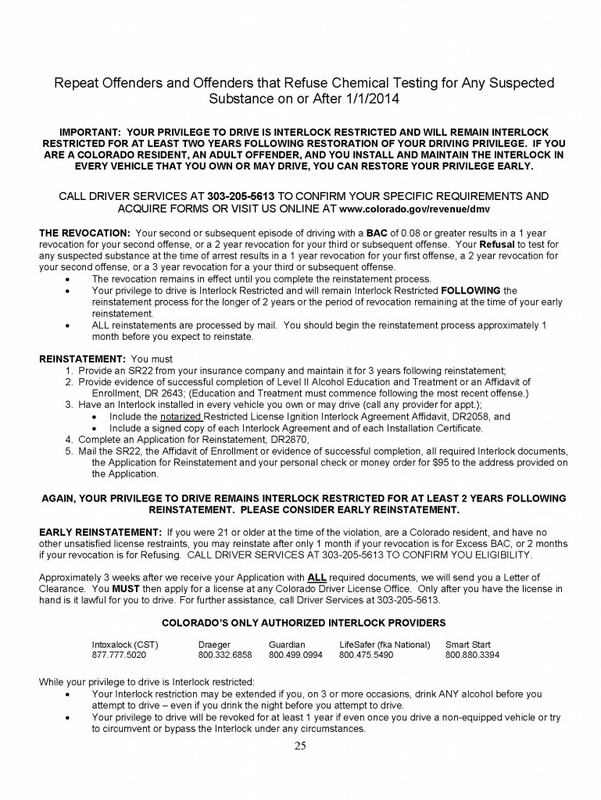 Repeat DUI offenders and those offenders with a BAC of .15 or greater must have the interlock for a minimum of two years. The private companies who lease these interlock devices must submit monitoring reports on each driver to the interlock program. If there is are “fails” indicated in these reports the license restriction requiring an interlock can be extended. If the DMV finds that the ignition interlock has been circumvented or if the individual drives a non-interlock equipped vehicle, their license will be revoked for at least one year AND the person is subject to Class One Misdemeanor charges. When the probationary license is permitted … it is with an ignition interlock. First time offenders 21 years of age and older who have a BAC of > .08-.149, may obtain an Interlock Restricted License after one month of “hard� restraint (no driving) provided they are not under other DMV based penalties. Four Month – Early Reinstatement – If the ignition interlock driver drives problem free while on the interlock,( such as no failed starts and/or circumventions,) that person is eligible for an unrestricted license after only four (4) consecutive months. Multiple Alcohol Convictions – used to mean – no possibility for a probationary license – after January 1, 2014, also reinstate after one month by providing proof of an Interlock lease for each vehicle they own or have accessible to them and proving they have not been charged in any new offenses. ABOUT THE AUTHOR: H. Michael Steinberg – Email The Author at hmsteinberg@hotmail.com – A Denver Colorado DUI – DWAI – DUID Criminal Defense Lawyer – or call his office at 303-627-7777 during business hours – or call his cell if you cannot wait and need his immediate assistance – 720-220-2277. If you are charged with A Colorado crime or you have questions about the topic of this article -How To Understand Colorado DUI – DWAI – DUID DMV Actions After January 2014 – A Primer , please call our office. The Law Offices of H. Michael Steinberg, in Denver, Colorado, provide criminal defense clients with effective, efficient, intelligent and strong legal advocacy. We can educate you and help you navigate the stressful and complex legal process related to your criminal defense issue. and all the other cities and counties of Colorado along the I-25 Corridor… on cases involving the subject of this article – How To Understand Colorado DUI – DWAI – DUID DMV Actions After January 2014 – A Primer.